A problem you often see with other bicycle transport cases is that they are subject to damage from the weather. 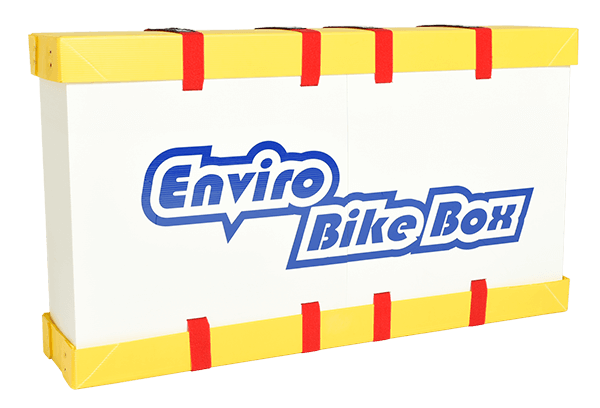 The main body of the Enviro Bike Box is made from Twin-Plastic Board, completely waterproof and flexible enough to withstand most turbulent conditions during transit. Within the box there are Velcro elastic straps used to stabilise and contain the equipment. They act as shock absorbers that don’t relay direct impact through to the equipment. The straps remain flexible yet firm so any force is dissipated, ensuring less potential for damage so you don’t have to worry about your bike and equipment during bumpy travels. Generally you’ll find most bicycle cases to be heavy and cumbersome to move around. The Enviro Bike Box solves that by utilizing lightweight materials that allow it to weigh between 5-6kg. 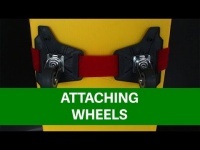 Not to mention the affordable attachable wheels addon that makes it extra mobile. You can simply pull it along with the straps when moving it. It also comes with the bonus of disassembly into a flat-pack again. This allows you to flatten it and store it using minimal space when you aren’t using it. 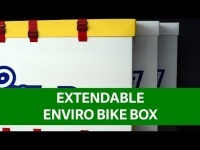 One of the great features of the Enviro Bike Box is that it is extendable. The various sizes it can expand or retract to permit it to fit almost any bicycle type. This includes tandem bikes, recumbent bikes, large mountain bikes and even electric bikes. It’s ideal for the rider with multiple bikes. You can fit more than just your bike though, there’s enough extra space with most bike to fit your accessories and peripherals in as well! The Enviro Bike Box is accepted by all major airlines, such as Qantas Airlines and Virgin airlines, as a safe and secure means of transporting equipment. It meets all the regulations and requirements so there shouldn’t be any problems with getting your bike on the plane! Since the bike box is about half the weight of traditional bike boxes, you’ll be saving even more money on fees to have it delivered as well as the security of knowing it will be delivered in the safest way possible. There’s many ways that the Enviro Bike Box can actually SAVE you money! Cheaper than traditional bike cases. With its minimalist design and materials, the Enviro Bike Box is very affordable for the average cyclist. Replace the part, not the whole. If any single part of the case gets damaged, you can replace just that part instead of the whole box. Re-use it for multiple trips. Most other bicycle cases last about 4-6 trips at best. 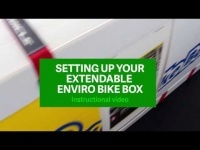 The Enviro Bike Box can last you over 2 years with proper care and use. Save on transport fees. Since it weighs less you’ll have to spend less to have it shipped or transported. We care about the environment and understand that there is a lot of waste generated from bicycle transport. The Enviro Bike Box actively tries to negate that effect by being completely recyclable and having individually replaceable parts to avoid disposal. There’s no need to buy another box when you can simply fix the one you have now. One of the great aspects of the simple design of the Enviro Bike Box is that it allows you to add and modify it to your specific needs. Twin Plastic Board and similar materials can be purchased at your local hardware store and added to your bike box as you like! The Enviro Bike Box is a must for all cycling enthusiasts. Compared to other bicycle cases it is the best way to ensure the safety of your equipment. Twin Plastic Board has countless qualities that make it ideal for bicycle transport. It’s a sturdy yet flexible material that protects your bicycle from the elements and also bumps along the way. Through the eyelets in the Enviro Bike Box you can further secure your equipment with locks with the assurance the Twin Plastic Board will not be accidentally or incidentally tampered with. Your equipment will be safe from theft and from most unforeseen occurrences during your travels. Suitable for all kinds of bikes as well as tandem bikes, large mountain bikes 26, 27.5 and 29 inch wheels, recumbent bikes, electric bicycles and more!